A synopsis of an interview with Jim Rickards, New York Times bestselling author of The Death of Money and Currency Wars, by Edward Harrison of RT Boom Bust. Jim is the editor of Strategic Intelligence, Chief Global Strategist for West Shore Funds, former general counsel for Long Term Capital Management, and a consultant to the U.S. Intelligence community and U.S. Department of Defense. Regional Reserve Bank Presidents are at the FOMC, so they have a powerful role, but there’s a distinction between being on the Board of Governors of the Federal Reserve on one hand and being a Regional Reserve Board President on the other hand. The Governors don’t hold the Reserve Bank Presidents in that high a regard. All the Federal Reserve Bank Presidents are there at the FOMC meeting. Some are voting and some are non-voting on a rotating basis, but they are all there and they all get to say something. But the decisions are actually made by an inner core. There are seven members of the Board of Governors, but there are two vacancies, so there are really only five sitting governors right now — Janet Yellen, Stanley Fischer, Daniel Tarullo, Jerome Powell and Lael Brainard. The main three of the inner core are Yellen, Fischer and William Dudley (New York’s Reserve Bank President who is an exception because he is a powerful voice). Add Brainard, who is the thought leader at the Fed right now, and you have the inner core of the Fed making the decisions. The twelve Regional Reserve Bank Presidents (with the exception of Dudley) have their own views but don’t carry that much weight. When they make a statement they are either stating their own views or they’re being asked to go out to condition the market and test the waters. It’s all an expectation game. It’s all a form of manipulation. The Regional Reserve Bank Presidents don’t have much weight, but the market puts weight on what they say and we have to watch the market. We’ll see what happens in June. The Fed isn’t looking at the Labour Market right now — they’re just looking at inflation. Yellen’s article at the New York Economic Club on March 29, 2016 adopted the position that they don’t know what they’re doing or what’s going to happen, but if they tighten early and get deflation they can’t fix it and if they pause and cause inflation they can fix it. So they believe the risks are asymmetric and it’s better to do nothing than to make a mistake that they can’t fix. If the Fed hikes rates then the equity market will probably go down 10%. The reason is that throughout most of Quantitative Easing — QE 1, QE 2 and QE 3, the Fed was trying what you call the “portfolio channel”, which is to make fixed income so unattractive to you, with such low rates, that you’ll go out and buy stocks and real estate. That will pump up the asset values and create a wealth effect. That way people will lend and spend. That theory is nonsense but it’s the theory the Fed was operating under. Those channels aren’t working anymore. The only channel left is the currency wars: exchange rates. At the Shanghai Accord in February 2016 it was decided to keep the Chinese yuan pegged to the U.S. dollar, because when they broke the peg last August it triggered a stock market sell off. So they’ll keep the peg in place and just cheapen the U.S. dollar. That way the yuan will go down at the same time as the dollar does. The yen and the euro will have to get stronger, but that’s too bad for them because they had three years of weakness and Japan blew their chance. That’s the playbook — peg the yuan to the dollar and weaken the dollar. The problem is that if the U.S. raises interest rates then you’re going to strengthen the dollar, and then the Chinese will break the peg and unilaterally devalue the yuan. China has been playing ball with the U.S. for the last three months, but they’ll devalue on their own because they’re desperate and their economy is slowing dangerously. So the Fed is playing with fire. If they raise rates it will strengthen the dollar, China will break the peg, and the stock market will fall out of bed. Jim guesses the Fed won’t raise interest rates but if they do then look out below. The riskier bonds in the energy field are going to default. It won’t be triggered so much by the U.S. interest rates but by the price of oil. The magic number is $60 per barrel. At lower than $60 per barrel the frackers go out of business. It might happen quickly or one at a time, depending on how low the price goes, but oil would have to get up to $70 or $80 per barrel to save the frackers, and there isn’t anyone who thinks it’s going there. When you raise interest rates and make the dollar stronger that means a lower dollar price for oil and that would hurt the frackers even more. So, the frackers are in trouble and a wave of defaults is coming, but if the Fed raises rates and there’s a lower dollar price for oil then that’s more bad news for the frackers. 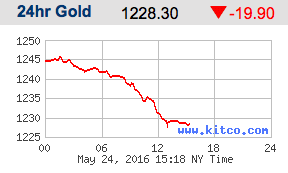 Gold is $1,228.30 U.S. per ounce. Preparing for the Fall live boutique album is available on iTunes — featuring Wag the Dog, Black Swan Dive, American Pie and Gods of the Copybook Headings. When a nation leaves the gold standard and sound money, and borrows to go to war, then hunger goes up, hope goes down, anger goes up, then it all goes down.